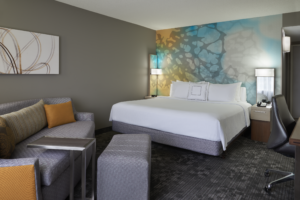 Renovations of the guestrooms and fitness centre are now complete at the Courtyard by Marriott Toronto Airport, reports Atlific Hotels. The hotel has 2,890 square feet of meeting space across three rooms. and spacious, modern bathroom, most of which have been retrofitted with a walk-in shower. The fitness centre has been expanded by 450 square feet. Updates include the addition of dense, rubberized flooring that offers greater traction and comfort; and new state-of-the-art aerobic machines, full weight machines, free weights, and a mat and ball area for all types of fitness or yoga needs. In addition, the hotel’s pool has been retiled and resurfaced, and new furniture has been added to the pool and patio area. Courtyard by Marriott Toronto Airport is a three-minute drive from Toronto Pearson International Airport. The hotel provides easy access to nearby attractions such as Woodbine Racetrack and Casino, Niagara Falls, Canada’s Wonderland and more. Atlific Hotels is one of the leading hotel management companies in Canada operating more than 55 hotels with offices in Montreal, Toronto and Vancouver. Its parent company, Ocean Properties Hotels Resorts & Affiliates operates more than 70 hotels throughout the United States. Together they manage over 125 properties in North America with 20,300+ rooms, which include independent hotels and resorts as well as internationally recognized hotel brands such as Marriott, Hilton, Westin and Holiday Inn.